LG's upcoming VR headset might be our new favorite. 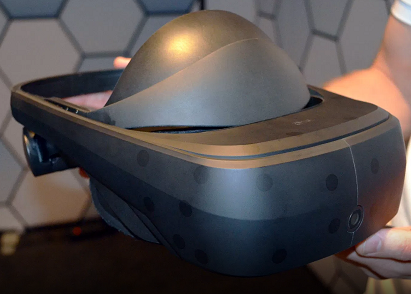 Its first company besides HTC to use Valve's StreamVR technology. LG partnering with Game developer Valve is coming with a next generation VR headset. It's similar to what HTC did with Vive recently. Promising on features LG is trying to bring similar prototype with high fidelity and better ergonomics. It has some resemblance with Sony Playstation VR, more comfortable than the HTC Vive and has a lighter design. There is no word on its price yet but surely it is going to be with much better features out there. The headset uses a firm supporting brace that loops around a back of your head which can be tightened with a simple dial. It is easy to wrap around your head. There is also a pivot point available that makes its angle settings work easier. On the other hand, it does not have an integrated audio so you will need headphones to hear. Again, no surprises in VR industry but surely it has higher resolution display with a much better mounting mechanism. At an actual hands on, it was much lightweight and easy to set at work. surely its more comfortable than Oculus Rift or the Vive. Taking it off the head was a bit easier than those in PlayStation or Rift. LG's 2017 headsets are all set for competition with Vive, Rift, and others. Its release date is still awaited but surely coming by this year end.